We think these two lovely gals in their hats look stunning in their senior portraits. Of course, we’re a little biased because they’re our nieces, Breanna and Bethany! Mullica Studio sure enjoyed the nice weekend getaway to Lake Okoboji for Rachel and Craig’s fun wedding. What a beautiful setting for a beautiful event! 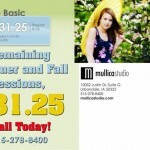 There’s still time to take advantage of Mullica Studio’s incredible fall senior portrait special.